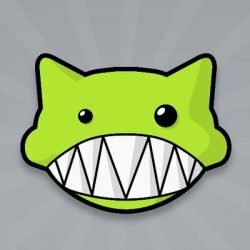 As one of the oldest torrent communities, the Demonoid tracker has gone through many ups and downs over the years. The site has disappeared for months, more than once, but always reappeared. Early last year things were looking quite positive for the site. Founder and operator ‘Deimos’ was committed to rebuilding the site back to the thriving community it once was, but at the end of the summer new problems emerged. Initially, there were some technical issues and isolated downtime. However, as the weeks passed on, the site disappeared completely. All the while, Deimos was nowhere to be found. This was particularly unusual as some staffers chatted with him nearly every day but that changed abruptly. Months went by without a word from Deimos. Meanwhile, some of Demonoid’s domains started to expire. Roughly two months ago, TorrentFreak received an anonymous tip which came as a complete shock. The short email pointed to information that suggested Deimos had passed away following a tragic accident. The information we received included several pointers that we could indirectly link to Demonoid’s founder. However, despite overwhelming circumstantial evidence, we were unable to confirm 100% that it was the same person. We shared this information with Demonoid staffer ‘phaze1G,’ who discussed it among the team. Slowly but steadily, the realization started to sink in that all signs indeed suggested that Deimos was no longer alive. Although there’s no complete certainty, phaze1G decided to inform the Demonoid community about the findings this morning. This wasn’t an easy decision and took weeks of consideration and attempts to get more clarity. “With great sadness, I want to announce that Deimos, the founder of Demonoid known as someone who was one of the earliest and influential people on the torrent scene since it’s beginning has died in an accident back on August, 2018,” phaze1G writes. The date of the accident, which was the result of a panic attack, coincides with Deimos’ disappearance. In addition, there were further signs that suggest that Deimos was indeed the victim. 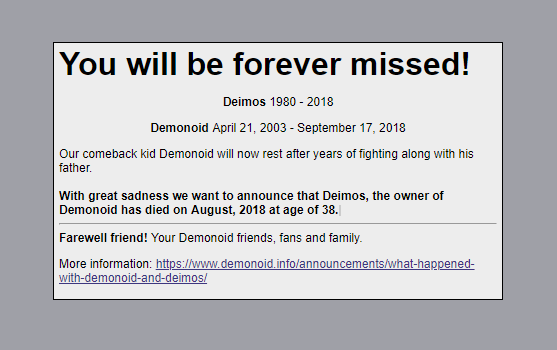 Phaze1G and other Demonoid staffers are devastated by the sad news and have put up a commemoration page to remember Demonoid’s founder. “Our comeback kid Demonoid will now rest after years of fighting along with his father,” the commemoration page reads. After the initial disappearance, there were reports that someone logged in to the site under his account. In hindsight, phaze1G believes that this may have been a friend or family member, who wiped the server, perhaps after making a backup. “It was someone with enough tech skills such as friends, family or Umlauf, so currently there is at least one person who holds the database of Demonoid and if it ever comes back that person will not be Deimos,” phaze1G notes. For now, the remaining staff have no idea where to go next. They created a temporary forum a while ago to keep the community going, but without Deimos, the spirit of the site is gone. “Demonoid Fora was formed as a reminder of Demonoid and Deimos, but I have no idea what to do next, or what to do regarding Demonoid at all. Demonoid is and always was Deimos’ child. Umlauf was there to help when it was hard, so without those 2 giants, there is no Demonoid. “Even if we recreate it from the ground with 99% identical look and features, it will not be it without Deimos and won’t have that feeling of home it once had,” phaze1G adds. Deimos started the site in his early twenties. While he handed over the reins to outsiders for a few years, he took over the helm again two years ago, hoping to return the site to its former glory. In the months leading up to his disappearance, he worked on the site continuously to achieve this goal, showing the passion and commitment many staffers knew him for. “Many things were happening behind the scene, he cared so much about users’ privacy and replied almost to everyone who private message him and asked how he was and stuff. He was really a friendly person,” phaze1G says. “I’m glad that I had a chance to know him and I will miss him dearly, not because of Demonoid only, but because of the person, he was,” he adds.